The 2019 FACT Fundraiser will be held at Palms Sports Bar in June! Check back here for details - coming soon! There will be fun and games, entertainment, raffles, auctions, a BBQ, and may be some FIREMEN - ohh! FACT hold a monthly Open Meeting on the FIRST MONDAY of each month starting at 6pm (18:00 hrs) at Palms Sports Bar, Avenida Europa, San Eugenio Alto. Come along and hear the latest news, talks on subjects related to cancer, treatments, and offers of help from businesses in Tenerife. If you want a private chat that can happen too, just let us know when you arrive. 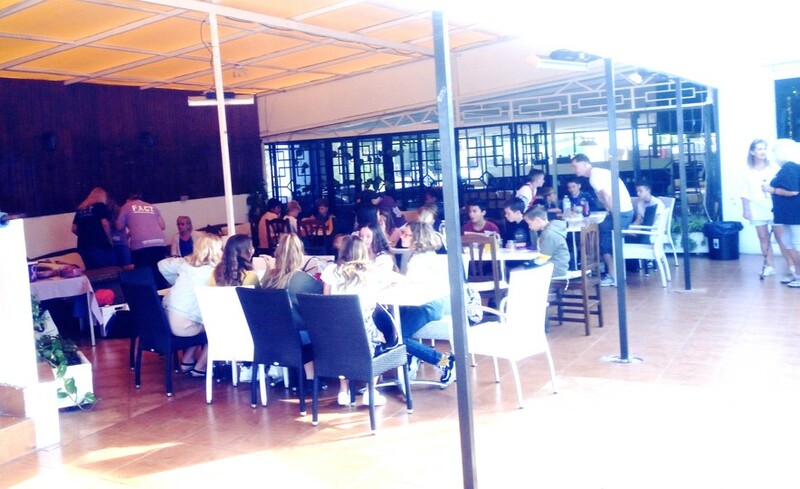 On their last day of term, Wingate classes 7 JH and 7 AR came to see FACT at Palms Sports Bar in San Eugenio Alto. While they were having a good time, this group picture was uploaded to FACT's website to mark their visit. They were greeted with cakes and squash, joined in various craft activities and had the chance to talk to FACT members about FACT's work with cancer sufferers. The visit raised an amazing 384,10 euros for FACT! Thank you very, very much!! !